Personal Testimonials from ScoutSMART users. ScoutSMART has greatly increased our efficiency through the summer. The ability to have all the information in such a rapidly accessible and easy to use format has allowed us to grow our summer business without adding to the length of our days. Our customers really appreciate the report formats and the ability to receive their reports via e-mail. I would strongly recommend ScoutSMART to any crop consultant. It improved my speed in doing reports as well as clients didn't have to interpret my hand written reports. 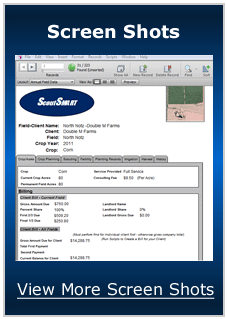 ScoutSMART was able to email out reports which more and more farmers are going to this standard. I waited a few years before jumping into the computer reports, and I am glad I finally did with ScoutSMART! I’ve just completed my permanent and annual field info for the ScoutSMART program. I really like it! After a few fields I got on to it and in a few hours completed all the info needed to get this season started. I’m really looking forward to using this program. I think you really got it right with the FileMaker Pro as it seems pretty easy to use and I just love the templates you’ve got in there to help get started. Thanks for the great work, I’m really looking forward to using the software.